Looking for pond stocking in the River Valley and NW Arkansas? We’ve got another fish truck delivery coming to Farmers Coop! 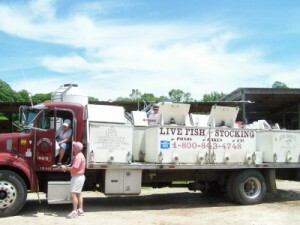 Arkansas Pondstockers fish truck will make multiple deliveries to Farmers Coop locations this month. And remember, fish purchases are CASH ONLY! The Arkansas Pondstockers fish truck will have channel cat, largemouth bass, black crappie, bluegill, hybrid bluegill, red ear bream, koi and fathead minnows. Find out what type and size fish we offer on our website. The Arkansas Pondstocker’s fish truck provides containers for all fish but the 11″ channel cats, so please bring your own containers for them. It is not necessary to pre-order the fish, but if you are looking for a large quantity or pond packages, we suggest you call. Questions? Call Arkansas Pondstockers at 1-870-578-9773. This entry was posted on Friday, March 1st, 2019 at 9:32 am	and is filed under Events. You can follow any responses to this entry through the RSS 2.0 feed. Both comments and pings are currently closed.